Despite the best of intentions when couples say, “I do,” more than a few will find themselves eventually saying, “I don’t.” Aside from the emotional issues involved in divorce, there are also tax and financial considerations. The resolution of these issues may depend in part on how amicable the parties remain, their financial status, whether they live in a community property or common-law state, and how any agreement would be affected by the Tax Cuts and Jobs Act of 2017 (TCJA). A taxpayer’s marital status is determined on the last day of the year. If the divorce is final by the last day of the year, then the spouses are treated as unmarried for the entire year, assuming neither has remarried by the end of the year. If the divorce has not been finalized by the end of the year, the spouses are married for tax purposes, and can file a joint return or separate returns. In addition, if the spouses live apart for the last six months of the year and one maintains a household for a dependent child, that spouse may qualify to file as head of household. Divorcing couples therefore may want to carefully consider in which year to get divorced; the couple may save money depending on whether they file jointly or divorce and each file as unmarried. Congress has added additional complexity to this timing issue by passing the new TCJA alimony rules (see below). Divorcing couples may want to carefully consider in which year to get divorced. Legal separation has the same tax effect as divorce. Thus, if a couple is legally separated on the last day of the year, then they are treated as unmarried for the year. Merely living apart and considering themselves to be separated is not a legal separation for tax purposes. With the enactment of the TCJA, the timing of when a divorce is finalized becomes vital. The longstanding rules apply: Alimony payments are deductible for the spouse paying the alimony, but includible in the income of the spouse receiving the payments. The parties to a divorce or separation agreement effective on or before December 31, 2018, may elect after that date to have the new rules apply. The rules are reversed; alimony payments are no longer deductible for the payor spouse, but they are not includible in the income of the spouse receiving the payments. In the typical divorce agreement under the old rules, the tax advantages usually meant that the spouse in the higher income tax bracket would make alimony payments to the other spouse, since the tax deduction would be greater if claimed by the higher income spouse. Under new TCJA rules, which are effective for divorce or settlement agreements entered into after December 31, 2018, a payor spouse would not get a deduction for the alimony payments made. Although the recipient spouse would not report the alimony payments as income, the overall tax advantages to the divorcing couple would be reduced, as noted in the example below. Olivia Harper, a successful actress, and Mark Harper, a struggling writer, will be getting a divorce under an agreement calling for Olivia to pay Mark alimony payments totaling $50,000 a year. After the divorce, Olivia will be in the 37% tax bracket, and Mark in the 22% tax bracket. If they divorce in 2018, Olivia’s $50,000 payment to Mark will be deductible and will reduce her tax by $18,500 ($50,000 × 37%), but the payment will be taxable to Mark, costing him $11,000 ($50,000 × 22%). With Olivia’s $18,500 tax advantage in mind, Mark’s attorney may well expect to gain concessions in other aspects of the couple’s settlement agreement. Based on the above facts, but assuming that Olivia and Mark divorce in 2019, Olivia will lose her $18,500 tax reduction, but Mark will no longer pay $11,000 tax on the $50,000 received. Viewed another way, the after-tax cost of Olivia and Mark, as one unit, will be $31,500 under the 2018 rules ($50,000 − Olivia’s $18,500 deduction), but will increase to $39,000 under the 2019 rules ($50,000 − $11,000 not taxed to Mark). Thus, before the TCJA rules take effect in 2019, there will be $7,500 more after-tax money between them to fund a settlement agreement, and a purely tax perspective would seem to favor finalizing the agreement in 2018. If an agreement is reached in 2018, the pre-TCJA rules will apply throughout the term of the agreement, no matter how long it lasts. If coming under these 2018 rules represents the will of the parties, the time to act is now, since it may take a bit longer to craft the settlement, as the tax professionals must do their due diligence with respect to the myriad of TCJA changes. a divorce or separation agreement executed on or before December 31, 2018, and modified after that date, if the modification expressly provides that the amendment made by TCJA to the alimony and separate maintenance agreement rules apply. Parties who fall under the pre-TCJA rules can retain these rules or be bound by the new TCJA rules if they so choose. Payments are made pursuant to a divorce decree or separation agreement. The divorce decree or separation agreement does not designate the payments as nontaxable to the recipient and nondeductible by the payor. There is no liability to make payments after the death of the recipient-spouse. The payments are not support. Voluntary payments, such as amounts paid without any court order prior to a final decree of divorce, are not treated as alimony (e.g., Milbourn v. Comm’r, T.C. Memo 2015-13, http://1.usa.gov/1pGTvDk). Payments made to a third party for the benefit of the former spouse, such as health insurance premiums to cover the former spouse, may be deductible alimony, assuming all the other conditions are met. The IRS requires the payor-spouse to report the Social Security number (SSN) of the recipient-spouse to ensure that amounts deducted align with amounts reported as income. Nevertheless, the Treasury Inspector General for Tax Administration (TIGTA) found in 2014 that there was a $2.3 billion gap between the amount of alimony deducted and the amount reported as income (“Significant Discrepancies Exist Between Alimony Deductions Claimed by Payers and Income Reported by Recipients,” TIGTA Report 2014-40-022, Mar. 31, 2014, http://1.usa.gov/21rkONO). To close this tax gap, the IRS may increase scrutiny of alimony deductions to ensure that recipient-spouses are reporting the income. Having a child complicates the divorce process. Unfortunately, the child may become a negotiating hotspot, with parents vying for custody, support payments, and concessions. For tax purposes, the dependency exemption is no longer an issue (it being repealed by TCJA after 2017), but child support may still be. The tax treatment of payments to support a child was not changed by TCJA; these payments are not taxable to the recipient-spouse or deductible by the payor-spouse. These include payments labeled as child support, as well as payments construed as child support because they are related to a contingency involving the child—for example, if the amount is reduced or eliminated when the child attains majority. If there is a delinquency in both alimony under pre-2019 law and child support, payments are applied first toward child support before being applied toward alimony (e.g., Becker v. Comm’r, TC Summary Opinion 2015-2). If a parent fails for some time to pay required child support, the IRS can apply a federal tax refund to the delinquency [Internal Revenue Code (IRC) section 6402(e)]. For this purpose, “past due support” means a delinquency for which the IRS has been notified by a state in accordance with section 464(c) of the Social Security Act. The tax treatment of pay ments to support a child was not changed by TCJA; these payments are not taxable to the recipient-spouse or deductible by the payor-spouse. No gain or loss is recognized on the transfer of property related to divorce (IRC section 1041); instead, the recipient spouse steps into the shoes of the transferor-spouse for basis purposes [IRC section 1041(b)]. When the recipient-spouse sells the property, he or she recognizes gain or loss on the transaction at that time; therefore, property settlements should factor into tax results. For example, stock worth $10,000 with a basis of $2,000 presents the recipient-spouse with a potential gain of only $8,000. A spouse who receives title to the home is treated as having owned the house during previous period of ownership as well, be it joint or by the other spouse. This can help such spouse meet the two-out-of-five–year ownership test for the exclusion [IRC section 121(d)(3)(A)]. A former spouse who continues to own the home occupied by the other spouse is treated as having used the home during the period that the other spouse uses it; again, this enables the former spouse to claim the exclusion [IRC section 121(d)(3)(B)]. Although the TCJA raised the standard deduction in 2018 to $12,000 for single taxpayers, the tradeoff for this was the elimination of several categories of itemized deductions, including those for miscellaneous itemized deductions (deductions subject to the 2% floor), medical expenses, and casualty losses. The deduction for mortgage home interest (for up to two homes) generally remains. The deduction for state and local taxes by individuals also remains, but it has been limited to $10,000, which will be particularly disadvantageous for persons living in high-tax states, such as New York. As a result of these changes, divorcing taxpayers may find it difficult to find itemized deductions above their individual $12,000 standard deduction amount. Couples divorcing in 2018 who do not opt out of the pre-TCJA alimony rules may be able to recoup some of their deductions lost by tax-wise transfers of a residence or residences, particularly if they have outstanding mortgages. This could be done if the settlement agreement gives the spouse in the higher tax bracket sole ownership of the couple’s formerly jointly owned home. This would give him the right to deduct up to $10,000 in state and local taxes paid on the home, as well as the mortgage interest deduction for the home. If the couple owns two homes, a transfer of both to the higher-bracket spouse would give him a deduction of up to $20,000 in state and local taxes ($10,000 for each home), and the mortgage interest paid on the two homes. For such a large property transfer, the lower-bracket spouse will understandably want to negotiate for better terms in other parts of the settlement agreement. If the settlement agreement is finalized in 2018, however, alimony would still be deductible to the higher-bracket spouse, thus freeing up more money to fund the agreement. One caveat to the above scenario: with a single taxpayer, the amount of deductible mortgage interest will be limited to interest on $750,000 of mortgage indebtedness, rather than the $1,500,000 amount available to married taxpayers filing jointly. Thus, the tax-wise viability of the above home transfer strategy might be stymied by the possibility that the spouse owning the two homes may lose a portion of her mortgage interest deduction. Generally, legal fees to obtain a divorce are not deductible. For example, a business owner whose ownership is at stake in a divorce settlement usually cannot deduct legal fees, even though they relate to the business (e.g., Melat v. Comm’r, T.C. Memo 1993-247, http://bit.ly/1Ri7fKV). The courts view the origin of the claim as a division in marital property, for which no deduction of legal fees is allowed. A spouse who obtains alimony under pre-2019 law, however, may deduct the portion of legal fees related to the production or collection of such income [IRC section 212(1)]. The attorney handing the divorce for this spouse should itemize the services so that the spouse can deduct the applicable portion of the fees. Benefits from qualified retirement plans, IRAs, and other employee benefit programs are important considerations during divorce. Divorcing spouses may want to change beneficiary designations to plans, as well as to life insurance policies, so that former spouses do not inherit benefits, as well as take the other actions below. the later of 1) the date the participant attains age 50 or 2) the earliest date on which the participant could begin receiving benefits under the plan if the participant separated from service. The alternate payee is not taxed if, when benefits are payable, they are rolled over or directly transferred to a qualified retirement plan or IRA of this spouse. The IRS and the Department of Labor (DOL) provide sample language for a QDRO at http://bit.ly/2NkzjHJ. Funds in an IRA transferred to a former spouse incident to divorce are not taxable to the owner [IRC section 408(d)(6)]. The transfer is also exempt from the 10% early distribution penalty [IRC section 72(t)]. If an IRA owner uses funds from the account to pay alimony, child support, or anything else related to the divorce, however, the funds are taxable and not exempt from the early distribution penalty [e.g., Bunney v. Comm’r, 114 T.C. 17]. The IRA owner must transfer the interest in the IRA, and not the funds themselves, in order to escape tax on the transfer. There may be an offsetting alimony deduction where applicable. If a spouse is covered under the other spouse’s employer’s health plan and the employer is subject to the Consolidated Omnibus Budget Reconciliation Act (COBRA), the spouse may opt to continue on the plan for up to 36 months (29 USC 1161). The DOL answers FAQs on COBRA at http://bit.ly/2pfuqBB. Usually an employee commits to contributions in medical flexible spending accounts (FSAs) for the year; however, upon divorce, the employee can change the contribution for the balance of the year [26 CFR section 1.1254(c)(2)(i)]. A couple who opts to receive on an advance basis the premium tax credit for health insurance purchased through a government marketplace (IRC section 36B) should notify the marketplace about the change in marital status. This changes the taxpayer’s advance payment amount. 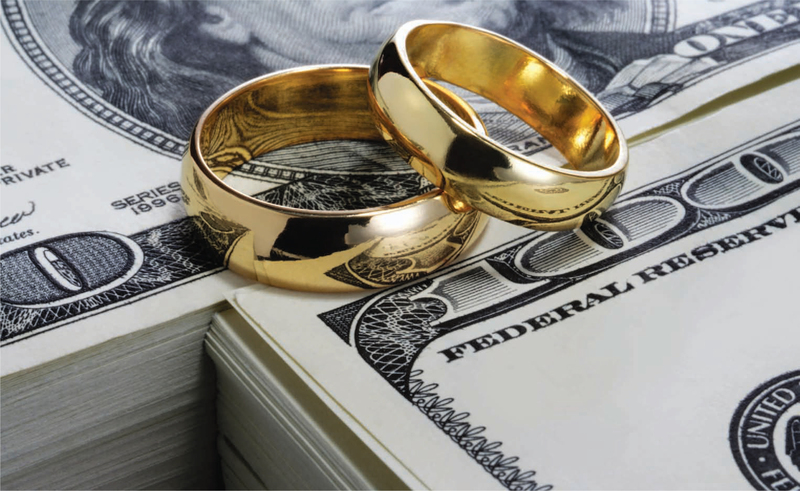 Divorce does not necessarily extinguish spousal rights to collect Social Security benefits. If the marriage lasted at least 10 years, a divorced spouse can collect benefits based on an ex-spouse’s earnings if unmarried and at least 62 years old. The ex-spouse does not have to be collecting benefits but must be eligible to do so (i.e., at least 62 years old as well). The benefit is 50% of the other spouse’s full retirement benefit if benefits commence at full retirement age. A divorced spouse collecting benefits under these conditions does not affect benefits for the ex-spouse, the ex-spouse’s children, or the ex-spouse’s current spouse. Note that the 10-year marriage duration may affect the timing of a divorce. The death of a former spouse does not bar a surviving divorced spouse from collecting benefits. Again, if the marriage lasted at least 10 years, the survivor can collect starting at age 60 (or 50 if he has a severe disability). This is permitted even if the surviving divorced spouse has remarried, as long as the remarriage occurred after reaching age 60 (or after age 50 if disabled). A former spouse can also collect benefits if the divorced wage earner has died if the couple has a child under age 16 (or older but disabled). In this case, the age or length-of-marriage rule does not apply, as long as the survivor is caring for the child. Divorce is never easy, and taxes, particularly in light of the TCJA, complicate a difficult situation. Attention to tax and financial issues, however, helps the parties involved create certainty and avoid problems later on. CPAs should use the accompanying checklist to make sure they cover the essentials. [ ] Consider filing separately if a spouse has concerns about becoming liable for taxes on a joint return. [ ] Consider the long-term tax consequences in property divisions (e.g., which assets have potential gains). [ ] Prepare an inventory of marital assets and liabilities (e.g., mortgages). [ ] Nail down the desired treatment for alimony (taxable or nontaxable); will the divorce agreement be finalized in 2018 or thereafter? Both spouses should agree to the treatment. If the pre-2019 rules will apply, consider that the payment of a former spouse’s medical costs under the terms of a divorce settlement is deductible alimony. In effect, these costs become deductible as adjustments to gross income rather than itemized medical deductions subject to the applicable adjusted gross income (AGI) floor. [ ] Decide on tax liability for stock redemptions. [ ] Couples who co-own a corporation that one spouse wants out of can agree in writing that either a redemption of stock will be taxable to the transferor-spouse or taxable to the redeeming spouse. [ ] Make arrangements for transfers of retirement benefits. No court order is necessary to make transfers of IRAs tax-free as long as they are incident to divorce. Note that tapping IRA funds to satisfy alimony is a taxable event. Use qualified domestic relations orders (QDROs) to avoid tax on the plan participant when the retirement account is paid (in whole or in part) to an alternate payee (e.g., former spouse). [ ] Advise on deducting legal fees related to tax advice in the divorce. [ ] Determine the impact of divorce on Social Security benefits. [ ] Revise wills and beneficiary designations. [ ] The dependency exemption no longer applies in 2017 and thereafter (although it may come back in 2026) under the TCJA. Thus, this has been removed from divorce settlement negotiations. The enhanced child care credit under the TCJA may make up for this loss to custodial parents. This article, which originally appeared in the April 2016 CPA Journal, has been updated by the authors to reflect the impact of the Tax Cuts and Jobs Act.